Here are twenty-seven pictures taken by Tim O'Dowd who graduated in 1979. It sure beats the way Randy Hawthorne used to tape photos to the blackboard in the locker room a few days after the event (yes that is one more thing he has done for the team!). 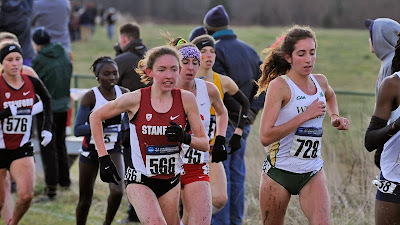 Senior Elaina Balouris finished 11th at the NCAA meet followed by Emily Stites in 46th, Meghan McGovern in 113th, Michelle Britto in 122nd, Corolyn Hennesseey in 141st, Dylan Hassett in 167th and Erica Arnatori in 226th. As a team the women performed better than all but the 1998 women's team with a 12th place finish. The finish was six places higher than their ranking coming into the meet. 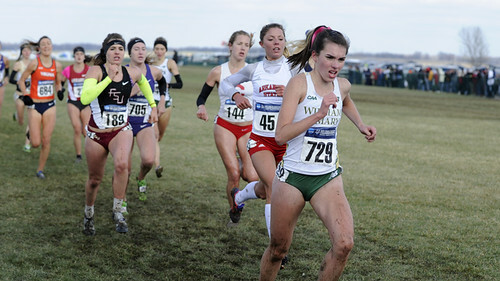 I am still getting used to the idea that the NCAA XC meet will not be on a Monday, but in fact on this Saturday. Go here to watch it live at noon. The men's race is at 11:55 am and the women's is at 1:10 pm (EST). We tried tonight to do an interview and had some technical problems so I am hoping to do it again on Friday so you can see the excitement of the women's team before they race on Saturday. Jill Miller (and Steve Walsh, who is head of the track/XC programs) has led the women's team to two straight NCAA appearances in her three years at W&M - an impressive record to say the least. 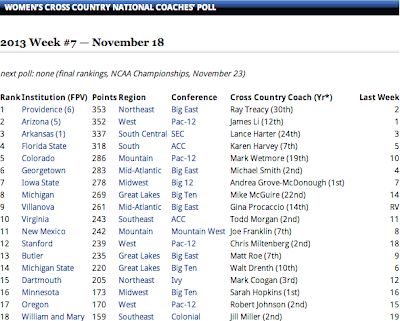 Now the latest coaches' poll has the women ranked 18th in the US. 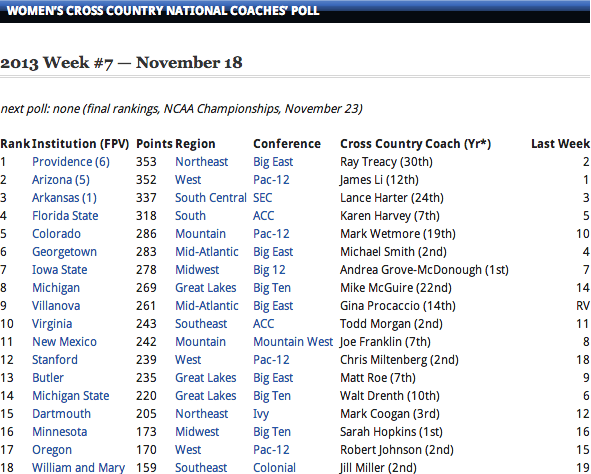 But with two very high scorers in Stites and Balouris, it seems likely that they will finish higher at the NCAA meet. Look for an interview later this week with Miller and her two low scorers.